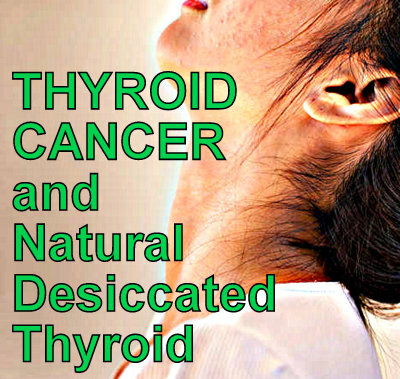 Home » Thyroid Cancer and Natural Desiccated Thyroid: are they compatible?? Thyroid Cancer and Natural Desiccated Thyroid: are they compatible?? Why do doctors say this?? They also say “NDT is not stable”...or “NDT is not safe”…or “NDT is hard to regulate“. The latter of course are completely false statements! NDT has proven to be perfectly stable over the years (many more recalls for instability for T4-only medicines!) and NDT meds have definitely proven safe over their 122+ years of use by patients. As far as NDT being “hard to regulate”- well, isn’t it odd that hundreds of thousands of thyroid patients have been doing just fine on NDT dosing, and have seen their lives change! 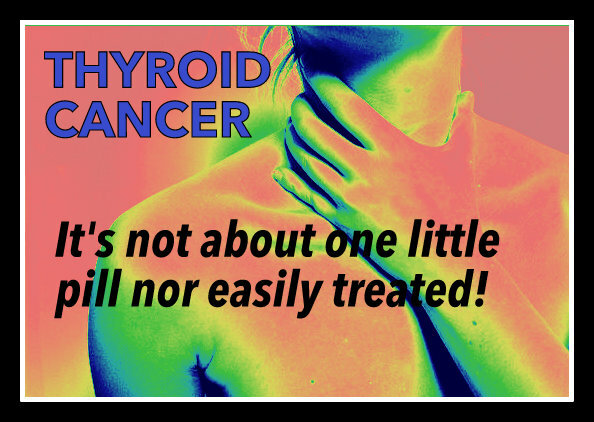 As many a thyroid cancer (thyca) patient and MD will tell you, the primary goal of post-thyroid cancer treatment is adequate thyroid replacement to include complete suppression of TSH levels. This prevents thyroid tissue from re-growing as well as preventing the thyroid cancer from returning. What better medication to suppress the TSH than NDT!! NDT (Natural Desiccated Thyroid) medications contain all 5 thyroid hormones that your healthy thyroid would have made- T4, T3, T2, T1 and Calcitonin. This gives complete thyroid replacement, which is exactly what a thyroidless person needs to feel and function their best. In addition, the TSH is almost always suppressed fully to <0.5 (and some have a TSH of .004 or .009) with an adequate dose of NDT medication. Average doses are usually between 3-5 grains per day, the same as what a normal, healthy thyroid gland puts out in a day! Some may need a bit less, though, and some a bit more. But my doctor wants me to use T4-only to suppress my TSH? What does the scientific research say about using NDT with thyroid cancer patients? What research basically implies is that NDT is such a superior treatment that it can regress or stop cancer! NDT is known to improve your immune function. Does research talk about thyroid treatment for thyroid-less patients? What about the problem of thyroglobulin in NDT? Thyroglobulin is an iodine-containing protein–it stores iodine. So a healthy thyroid uses thyroglobulin’s storage to make T4 and T3, since both hormones are made from iodine. But thyroglobulin levels are used by physicians as a tumor marker for thyca patients, i.e. to see if your cancer has returned to any tissue the surgery left or inadvertently missed, especially for papillary or follicular thyroid cancer. Cancer can cause a rise in thyroglobulin levels! So if you use NDT, which comes from pig thyroid, you will also be getting thyroglobulin…and in theory making it more difficult to ascertain if cancer has returned. But reality is that 1) not everyone sees much of a rise of thyroglobulin from using NDT, and 2) even if you do, you can do a baseline of where NDT brings your thyroglobulin levels…and let your physician monitor any rise from that baseline, say experts! NOTE: some post thyroid cancer patients mistakenly think that rising thyroglobulin “causes” cancer. It does not appear to be the case, Though not all causes are clear, there seems to be more connection to family history, being older in age, or being exposed to high radiation. Jaime’s story: Had my TT in July of ’13. I had papillary thyroid carcinoma. After surgery I was put on 150 mcg of synthroid. Ached, emotional, craved sugar constantly (am also type 2 diabetic). Found a doc who prescribed me NatureThroid starting at 1.5 grains. I have since lost 80 lbs, am no longer insulin dependent or take any meds for diabetes. I don’t ache or crave anything any longer. I RUN everyday. Before, I could barely walk. I am so much happier and healthier and will never go back to T4 only meds again. I believe that NDT saved my life. Yes, I have worked hard too, but without the meds that took away the pain and gave that energy and motivation, I couldn’t have done it. Plz open ur eyes and mind to the benefits of this medication. Amy’s story: Although I haven’t been on NDT long, I think the immediate differences are amazing. I was diagnosed in Dec 2008 with Thyroid Cancer and had 2 operations to remove my thyroid in the same week in Jan 2009. They took half, did a frozen biopsy to make sure it was cancer, then called me back in to remove the other half. I also had RAI treatment. I was put on Synthroid medication for around 12 months before being put on a combo of T4/T3 medication, then dropping to only T3 medication. During the last 5 years of being on this medication, I lost motivation, had exhaustion, was in pain walking, had body aches, and my muscles would feel like i had been running non stop for days, just from walking up the hallway. I lost my confidence, put on weight, didn’t have the energy to work out even though i wanted to, had erratic sleeping patterns, poor digestion and constipation. I would nap every day but still feel so tired, terrible brain fog and poor concentration. I’ve only been on NDT for 17 days and today is my 18th day and already all of these symptoms have gone! I have energy; I am getting back to my happy-go-lucky self; I sleep soundly every night and can fall asleep within 10 minutes; I wake up refreshed and full of energy. I don’t nap during the day: I do many things every day now; I am focused with a clear mind and don’t get drained just from a 30 min conversation! I am more patient again and can deal with situations that would upset me and frustrate me before. I also don’t ache anymore and feel like my strength is returning instead of hobbling around. Also my libido has just jumped back on board over the last few days! Yay!! I can’t wait to see how i feel after 6 months, a year and 5 years! Marilyn’s story: I’ve been on Synthroid for 10 years after being diagnosed with Hashimoto at 23, and never felt well. Ever. Had 2 successful pregnancies and one miscarriage. Been Dx with many other illnesses throughout those 10 years, from depression, anxiety, chronic fatigue syndrome, chronic migraines to bipolar… Was in so much pain all the time, depressed, exhausted. Switched to NDT (ERFA) back in 2012 after fighting really hard and going to numerous doctors and endos. I started feeling better but then discovered adrenal exhaustion (no wonder) and very low iron. Had to work on those for a few months before being able to successfully increase ERFA. Was Dx with thyroid papillary cancer in January 2014, had a partial thyroidectomy in March 14. Still on NDT and doing better then I have in a decade (beside the latest issues with a probable bad batch any way). Van’s story: I was diagnosed with thyca in 2005. It had spread and it took a 13 hour surgery for neck resection. I had RAI after. I started feeling poorly after six months: tired, weak, exhausted. I supposedly had the best endocrinologist in the area! He only tested my TSH and couldn’t understand why i felt so bad. (duhh) Not that he really cared how I felt. When my joint pain made it so i couldn’t work, I started to do my own research and luckily i stumbled across STTM. I also bought some thyroid-s online so i could dose myself per STTM. Today, I’m taking 3 grains of NDT and feel great. I lost 7 years and now I”m a proponent of NDT to help anyone who asks for it. BOTTOM LINE: we hope the above information helps in your relationship with your doctor, as the final decision is up to YOU.